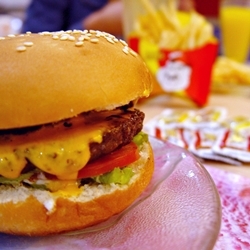 The fast food industry is notorious for targeting children in their marketing campaigns. Kid's meals, kid-centric advertising, cartoon characters and endorsements from popular movies and TV shows mean a large portion of the industry's demographic is children. At a time when obesity is of utmost concern, it's important that our children grow up with healthy habits and nutritional guidance. While adults are able to think more critically about their food choices, children can be easily influenced by gimmicks and advertising. We need to call on the fast food industry to take responsibility for its role in childhood obesity. Ask major fast food corporations to cease marketing to children. I am worried about the health of America's children, and you should be too. According to the CDC, in 2012, more than one third of children and adolescents were overweight or obese. That's a shocking number, and it's only growing. Children are very susceptible to advertising gimmicks, and you've continually used popular cartoon characters, toys and film endorsements to entice children to eat your food. Doing so places more importance on the gimmicks than the food itself—the negative health repercussions get buried under slick advertising and cheap schemes. Please stop contributing to the deteriorating health of our children! End your kid-centered campaigns now. That's 11,972 signatures! Let's keep the ball rolling.